Under Britain’s White Paper of 1939 Jewish entry to Palestine was restricted to 10,000 immigrants a year. Aliyah Bet was the code name given to the clandestine immigration of Jews to Palestine under the British Mandate that operated from 1934-1948. In total, over 100,000 people attempted to illegally enter Palestine, using 120 ships that made 142 voyages. More than half were stopped by Britain’s Royal Navy, only a few thousand refugees successfully got through the blockade and entered Palestine. Originally the British held the illegal immigrants at the Atlit detention camp built in 1938 just south of Haifa. The Atlit camp was surrounded by three barbed wire fences and guarded by armed sentries in six watch towers and held men, women and children. The camp is eerily reminiscent of the Nazi concentration camps. 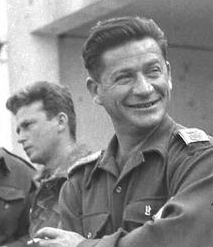 On the night of October 9, 1945 Palmach special forces led by Nachum Sarig, later commander of the Negev Brigade, and a youthful Yitzhak Rabin broke into the camp and led the 208 detainees on foot to freedom. After that the British sent the would-be immigrants to internment camps in Cyprus. My parents entered Palestine on May 7, 1947 ostensibly as visitors but intending to make aliya; the British allowed them entry as they were Canadians and hence, British subjects. Captured off Haifa by the HMS Pelican on April 26, 1948 after fierce resistance which left a number of people injured, the Nakhson with 553 passengers on board was the last ship stopped by the British. On the morning of May 15, 1948 the British left Palestine. This is one account that I found, submitted to a newsgroup, http://newsgroups.derkeiler.com/Archive/Soc/soc.genealogy.jewish/2008-12/msg00266.html by Rony Golan. 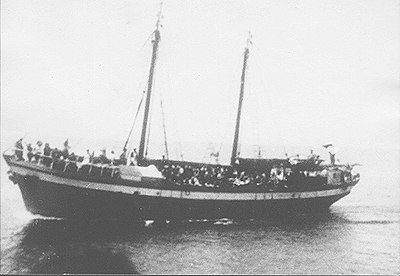 I believe that the first legal boat of immigrants to the State of Israel was the Orchid (“Orchidea”) that left Italy from Gulf Gaeta on May 8, 1948 and was supposed to arrive to the shores of Palestine in mid May 1948. The British discovered the ship while at sea. The boat received a radio transmission from an Israeli radio operator of the Gideon network (used by the Mossad l’Aliya Bet) to stay a day at sea and to change its name to “Medinat Yisrael” (Hebrew of the State of Israel). Hence, the ship entered the port of Tel Aviv on Shabbat May 15, 1948, while the State was proclaimed on Friday. Some sources say that the ship arrived to Haifa, but this is incorrect, since Haifa port was proclaimed a closed military zone, as the British had not finished withdrawing their troops from Palestine. There are photos of the arrival of the ship both in the Central Zionist archives in Jerusalem as well as in USHMM in Washington, D.C.. The source of the above information is my father, who was a crew member of this ship. The British discovered the ships (Medinat Yisrael with 243 passengers and LaNitzachon with 189 passengers) that had left Brindisi, Italy on May 8th on May 15th near Tel Aviv but did not intercept them as they had already announced the end of the British Mandate and were departing the country. The next morning the two boats reached the port but were forced to keep away from the shore because of bombing by Egyptian planes. The following day, May 17th the Jewish immigrants disembarked openly on the shore of Tel Aviv in the sovereign State of Israel. 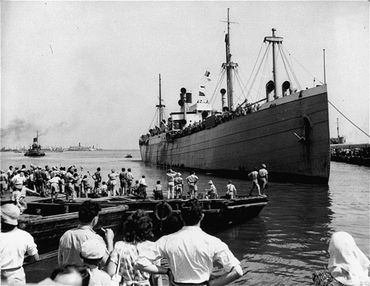 There is record of a ship “Pan-York,” carrying Jewish refugees from southern Europe to the newly established State of Israel, via Cyprus, docking at Haifa on July 9, 1948. In 1987 Atlit was declared a National heritage site. It’s a site very worth visiting to better understand the period that lead up to the establishment of the State of Israel. This entry was posted in Museum and tagged Aliyah Bet, Atlit, escape, immigration, Palmach, Tel Aviv, Yitzhak Rabin on December 19, 2012 by Shmuel Browns.